"USS Virginia Base member John Mosticone volunteered back in September of 2013 to produce a “first ever” Base newsletter. He then proceeded to review other Base newsletter formats, solicited input for the first edition, asked members to vote on the frequency of publication and sponsored a contest to come up with a name for the newsletter. 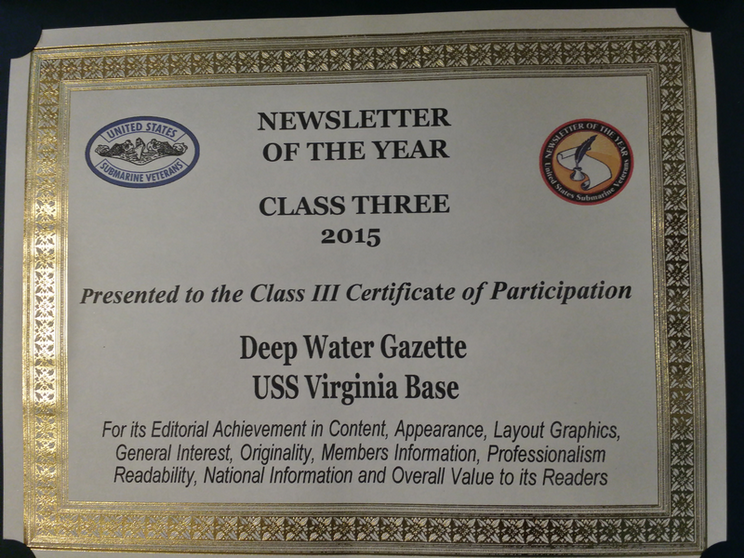 In December 2013, the Base voted for the newsletter to be published quarterly and all proposed names were considered - with the name garnering the most votes being one John had submitted himself – which was “USS Virginia Base Deep Water Gazette”. John then put the finishing touches on the first edition which he subsequently published in January, 2014 and he has been faithful to publish a new edition every quarter. All editions are transmitted to Base members in Adobe PDF format as an e-mail attachment – and each issue is also posted on the Base web site at: www.ussvirginiabase.org. Hard copies are mailed to each of the two members who do not use e-mail. The single issue I am submitting is the most recent “Second Quarter 2015” edition of the USS Virginia Base Deep Water Gazette, which I’m sending as a separate e-mail attachment along with this Word document. USS Virginia Base has been considered a “Small Base” ever since it was chartered on July 25, 2002 and only recently this year went to 53 members – moving us officially into the “Medium Base” category for purposes of this award. John Mosticone is an outstanding submariner who has demonstrated by his actions the objectives of our creed and his newsletter is strongly recommended for the 2015 Newsletter of the Year Award in recognition of his service in support of USSVI, USS Virginia Base and all submariners." The photo below is of the award John and the Base received at the 2015 USSVI National Convention - and scroll down further to the table where each of the ten newsletters John published can be individually read as Adobe PDF documents when they are clicked on.